Zachary Levi Pugh , better known by his stage name Zachary Levi , is an American television actor, director, and singer known for the roles of Kipp Steadman in Less than Perfect, Chuck Bartowski in Chuck, and Flynn Rider in Tangled. 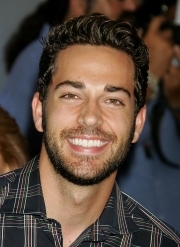 Zachary Levi Pugh was born in Lake Charles, Louisiana, to Susy and Darrell Pugh.He is the middle child between two sisters, Sarah and Shekinah. He is of Welsh ancestry. As a child, his family moved all over the country before making their final move to their new home in Ventura, California, where Levi attended Buena High School for four years. He began acting in theatre at the age of six, performing lead roles in regional productions such as Grease, The Outsiders, Oliver, The Wizard of Oz and Big River at the Simi Valley Cultural Arts Center. Levi first appeared in the FX television movie Big Shot: Confessions of a Campus Bookie. He played Kipp Steadman on the ABC sitcom Less Than Perfect. He also portrayed a potential boyfriend of Charisma Carpenter's character, Jane, in the ABC Family television movie See Jane Date. Levi was slated to be a lead in an ABC pilot called Three for the 2004/2005 television season. It was written by Andrew Reich & Ted Cohen, and would have costarred James Van Der Beek, Jama Williamson, and Jacob Pitts, but the show was not picked up. Levi financed Kendall Payne's album Grown after she was dropped by her label, Capitol Records. He landed the starring role in Chuck, a series in the midst of its fifth and final season. Levi and his Chuck co-star, Yvonne Strahovski, were both nominated for Best Action Actor and Actress Choice TV Series for the Teen Choice Awards 2010 where they both won and presented. In the summer of 2008, Levi was named one of Entertainment Weekly's Top Thirty People Under Thirty. He later starred in the film Alvin and the Chipmunks: The Squeakquel in the lead role as the Chipmunks' cousin Toby Seville. He stars alongside Mandy Moore in the 2010 Disney-animated feature film Tangled, which is based on the popular fairy tale Rapunzel. He voices Flynn Rider, a bandit who finds refuge in Rapunzel's tower. Levi provided narration in the 2011 film Under the Boardwalk: The Monopoly Story, a documentary about the game of Monopoly. Levi hosted the 2011 Spike Video Game Awards. In April 2010, Katharine McPhee released a preview of a music video to cinemas for her single "Terrified". Levi duets with her on the song (which was re-recorded; the original album version features Jason Reeves) and appears in the music video singing with McPhee. On May 3, 2010, the song was previewed on Entertainment Weekly's website and was made available for purchase on iTunes. The full video premiered on May, 7th, 2010 on the music video website Vevo. He is also featured on the soundtrack of the movie Tangled singing a duet with co-star Mandy Moore called "I See the Light," as well as being featured in the song "I've Got a Dream." In honor of the Oscar nomination for Best Original Song, Levi and Moore performed "I See the Light" at the 83rd Academy Awards. He has also been a guest member of Band From TV, a band made up of actors from various American TV shows. Levi is a sports car and motorcycle enthusiast and owns a 2009 Nissan GT-R. He dated Caitlin Crosby from 2008 to January 2010. Levi is an Evangelical Christian and has been since childhood. In a 2002 interview with Relevant Magazine, he said, "My job on my set, I believe, is to first just love people and gain that trust with people where they know that I really do love them and care about their well-being, so that when they are running into problems, they will hopefully, at some point, come to me and ask me, 'What is your peace all about? What is your comfort all about? Where do you get your love? Where do you get your talents?' And I can turn to them and say without blinking, 'Jesus Christ.'" In September 2010, Levi started his own company, The Nerd Machine. Levi was selected as a participant in the Celebrity All Star Game at NBA All Star Weekend 2011 at Los Angeles. He played for the team coached by Magic Johnson. Levi is an avid gamer, having first played Super Mario Bros. and has come to appreciate video games for their ability to provide "interactive stories." Whole or part of the information contained in this card come from the Wikipedia article "Zachary Levi", licensed under CC-BY-SA full list of contributors here.